Pigments of green plants absorb light particles called photons and convert this energy into food for themselves. This process is called photosynthesis. In addition to acquiring energy from light, plants also receive information about their environment which then affects their morphology and behavior. By manipulating the light spectrum we can elicit desired plant responses such as great biomass development, flowering, rooting, anthocyanin build up etc. Every plant has different needs and every growth stage requires different kind of light. Valoya has developed spectra for all plant needs, from seed to sale (read more about Valoya’s research here). The terms ‘wide’, ‘full’ or ‘continuous’ spectrum refer to combining LED chips to produce all possible colors from the spectrum – just like the sunlight. The amount of each color in our spectra is fine tuned to the specific needs of different plants and their growth phases. Unlike most manufacturers, we do not simply use red, blue and white LED chips – creating a light spectrum out of only these passes the minimal threshold of what the plant needs and hardly qualifies the spectrum to be called ‘wide’. Red and white LED chips have originally been developed for applications different than horticulture, such as interior lighting, LED indicators in electronic equipment etc. These chips can be bought ‘off the shelf’ and the light produced by them satisfies basic needs of the plants, but does not represent a sunlight match. Valoya’s LED chips are custom made and developed specifically for horticultural purposes. Our roots are in science and our main expertise is photobiology. Besides creating a true wide spectrum in each of our spectra, we paid special attention to the ratios of particular colors in them. The ratios of spectrum colors, in particular red : far red (R:FR) and blue : green (B:G) are what determines successful plant growth. There is no one single spectrum to satisfy the needs of all plants at all growth stages which is why we have commercialised 5 spectra and why our biologists advise on the use of optimal one, on a case to case basis. Valoya’s wide spectra offer the best possible light for plants in an energy efficient way. Our patented spectra are designed to optimize growth of a variety of plants in different applications. In addition to photosynthesis, our spectra give valuable information to plants about their environment, allowing control of plant morphology and physiological traits. Below is the list of our standard spectra and customized spectra. Before commercialisation they have undergone rigorous research in collaboration with world’s leading universities and research institutes in order to create light that is optimal for plants, that speeds up their growth cycles and results in strong, healthy and nutrient dense plants. AP67: Strong vegetative and generative growth. NS1/NS12: Wide sun-like spectrum for research and biotech. G1: Enhancing ornamental flowering in HPS hybrid solutions. G13: Strong vegetative growth in HPS hybrid solutions. FR: Enhancing sun-like wide spectrum in HPS hybrid solutions. Valoya Canna+: Consistent yields and cannabinoid expressions. Our technology is patented. To learn more about our patents please see our patent portfolio. Typical values presented in the table.There may be some variation between the spectra in different fixture models due to a disparity in the LED layout. Photosynthetically active radiation (PAR), designates the wavebands of solar radiation from 400 to 700 nanometers that photosynthetic organisms are able to use in the process of photosynthesis. All wavelengths between 400 and 700 nm contribute to the photosynthesis, in addition wavelengths carry information about the plant’s surroundings. There is critical information for plants beyond PAR area, in the UV range below 400 nm and in the far- red region above 700 nm. These areas and their relative ratios strongly affect plant growth. Hence, it is more accurate to refer to photobiologically active radiation 280-800 nm. The R:FR ratio of a spectrum determines the ratio between active phytochromes (Pfr) and inactive phytochromes (Pr). R:FR ratio is the main cue for plants about their environment. Plants grown in shade conditions try to elongate their stem and leaves in order to achieve a better position in the canopy (catch more light), and produce seeds quickly (premature owering). Sunlight has a R:FR ratio of 1.2 and light under a canopy of leaves has a R:FR ratio closer to 0.1. The lower the R:FR ratio is, the higher is the portion of Pfr of the total phytochromes, thus the stronger the shade avoidance response is. The R:FR photon ratios can be calculated according to the definition by Sellaro et al. (2010); R:FR = (650–670 nm)/(720–740 nm). The B:G ratio determines the effectiveness of the blue light responses. The B:G ratio has also been connected to the shade avoidance response (stem and leaf elongation). If the B:G ratio is high, plants have short internodes, stems and leaf petioles. When increasing the green light portion of a spectrum, the blue light responses become “lighter”; plants are not as compact and leaf temperature increases slightly, due to partial stomatal closure. The B:G photon ratios are calculated according to the de nitions for different light colours by Sellaro et al. 2010; B:G = (420–490 nm)/(500–570 nm). Cryptochrome activity (CRY2, the blue-light receptor) can be calculated too, when blue light decreases and green light increases the value is smaller. 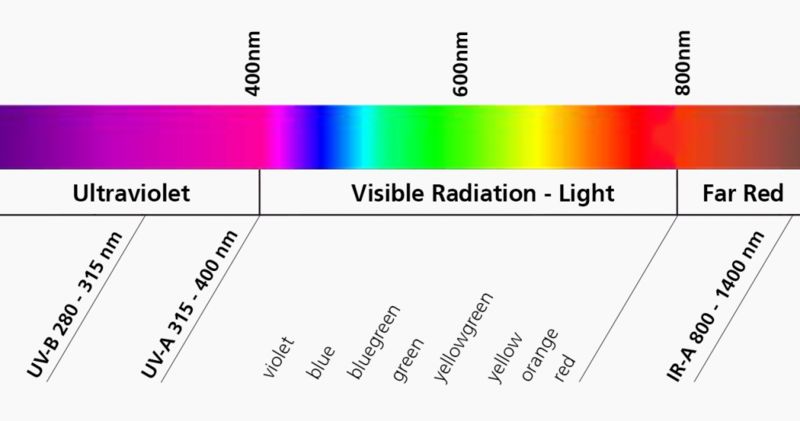 CCT (Kelvin) value is used to describe the color of a light spectrum. Generally the value is only used to describe different colour schemes of white light, i.e. those on a line from reddish/orange via yellow and more or less white to bluish white. Color temperatures over 5000K are called cool colors (bluish white), while lower color temperatures (2700–3000 K) are called warm colors (yellowish white through red). For example, the Valoya ARCH has a CCT value of 3700, and the NS1 4800, and HPS 2100. The color rendering index (CRI) is a quantitative measure of the ability of a light source to reveal the colors of various objects in comparison with an ideal or natural light source. CRI can be used to estimate how comfortable the light it is to human eyes, values under 50 are considered to be dif cult to work under for long time periods. CRI values for HPS are 20-40, depending on the lamp type. CRI value for traditional red-blue LEDs is zero! CRI values for Valoya spectra vary between 60 to 90, ensuring a comfortable working environment. Ratio between Pr and Ptot (photoequilibrium). Pr:Ptot ratio informs the ratio between the mainly red light absorbing phytochromes (Pr) to all phytochromes (Ptot), measured from a given spectrum (same as PSS value). Pfr absorbs some red light, so in red light, there is a balance of 85% Pfr and 15% Pr. Pr absorbs very little far-red light, so in far-red light, there is a balance of 97% Pr to 3% Pfr. Absorption spectra are measured by spectro- photometer. Action spectra are measured by plotting a response to light as a function of a wavelength. Plants have the ability to sense small changes in the spectrum, intensity and direction of light. Photoreceptors sense these light signals making it possible for the plant to adjust its development accordingly. Three major groups of photoreceptors have been identified: cryptochromes, phototropins and phytochromes. In addition, UVR8 photoreceptor is involved in the perception of UV-B radiation. Cryptochromes absorb UV-A, blue, and green wavelengths and are involved in photomorphogenetic responses. Cryptochrome mediated responses are for example cell elongation, stem elongation inhibition, and photoperiodic flowering. Cryptochromes function together with red- and far-red absorbing phytochromes. Green light can excite phytochromes, cryptochromes and phototropins. Green light has also been shown to be transmitted efficiently and drive photosynthesis in deeper layers of the leaf and enhance growth. Green light has also been shown to reverse some blue light induced responses. The variety of different phytochrome responses is extensive. Phytochromes absorb red, blue, far-red, and UV wavebands of the spectrum. Phytochromes affect stem elongation, leaf expansion and alter plant structure in response to crowding i.e. shade avoidance, which involves the plant perception to the changes in red to far-red ratio. Phytochromes also contribute to flowering. Chlorophylls (a and b are found in higher plants) are greenish pigments that capture the energy of light. Other pigments associated with the light harvesting machinery of plants, often referred as accessory pigments (e.g. carotenoids, xanthophylls), play an important role in photosynthesis as they increase the range of wavelengths usable for the photosynthetic machinery. Plants produce a large variety of compounds classified as phenolics. They have multiple roles, serving for example as defence against herbivores, attracting pollinators and acting as “sunscreens”, protecting the plant cells by absorbing shorter wavelength light (UV and blue), hence protecting the tissues from high-light stress (photoinhibition). Some phenolic compounds affect also the taste and flavor. Flavonoids are one of the largest group of phenolics; anthocyanins are responsible for most of the colors observed in flowers and fruits and together with flavones and flavonols protect cells from excessive radiation. Photosynthesis is about creating chemical energy (assimilates/sugars) from energy provided by light. All wavelengths between 400 and 700 nm contribute to the photosynthesis system, in addition wavelengths carry information that affects plant chemistry and morphology. However, photons at longer wavelengths (far-red) do also contribute to photosynthesis, this so called Emerson enhancement effect was demonstrated in the 1950’s. The rate of photosynthesis is greater when both red and far-red light are given together than the sum of the rates when given apart. This provided evidence that there are two photochemical systems working in tandem with a bit different wavelength optima. These are now known as photosystem I and photosystem II. Using the current PAR limits may lead to underestimation of photosynthetic carbon gain. Photochemical quantum efficiency measures the fraction of absorbed photons that engage in photochemistry, almost all of them do. Energy efficiency then is another thing, since only about a fourth of the energy in each photon is stored, rest is converted to heat. Plants typically convert only 4% to 6% of the available energy in radiation into biomass. Treating plant responses to elevated CO2 as an analog to increasing photosynthesis, one can estimate what could be gained through enhanced photosynthesis through plant breeding or genetic manipulation. Over the daily course, average photosynthetic enhancements under elevated CO2 are estimated to be about 30%. However, in studies related to increased levels of CO2, it has been found that the 30% enhancement in photosynthesis increases relative growth rate by only about 10%. Increased photosynthesis does not increase relative growth rate at the same speed since enhanced carbohydrate availability can exceed many plants’ ability to fully utilize it. This is due to nutrient or inherent internal growth limitations. Further, focusing only on photosynthesis can give unreliable indications of spectrum performance as the measurements provide results over a short of a time period only, usually only lasting minutes. Valoya has published a comprehensive lighting guide explaning light, photosynthesis, spectra, quality and other considerations for successful plant cultivation with LEDs. Please click below to get your copy.